Proper nutrition is vital to the health of companion birds. It has been found that improper nutrition is responsible for 90 percent of the health problems and the leading cause of death in companion birds. To make sure that your companion bird is receiving the proper nutrition, it is important to determine the type of diet that best suits its species, age, and current state of health. An avian veterinarian is the best source of information when choosing the proper diet for a companion bird. Commercial diets may be pelleted or a seed mix. Each diet type has benefits and detriments. One of the biggest advantages of a pelleted diet is that it provides a bird with balanced nutrition. Pelleted diets contain grains, seeds, vegetables, fruits, proteins, vitamins, and minerals. Each individual pellet contains the appropriate amount of nutrients. On the other hand, seed mix diets contain a variety of seed types and often lead to imbalanced nutrition because birds will pick out only their "favorite" seeds to eat. Individual seeds contain different types and levels of nutrients, which means that birds that eat only certain seeds are not receiving the adequate amount of nutrients. Seeds are also high in fat and low in essential nutrients. Pelleted diets are also more similar than seed mix diets to the diet that a bird in the wild would consume. In the wild, seeds make up only a small portion of a bird's diet and are only available during certain times of the year. Pellets contain a wide variety of ingredients, which match the varied diet of a wild bird. Pelleted diets can be formulated so that they are specific to the nutritional requirements of individual birds. Many brands of pelleted diets have different types of diets, including diets for smaller species, larger species, birds with medical conditions, and weaning birds. An avian veterinarian is a good source of information for available brands of pelleted diets and where to purchase them. If your bird is on a seed diet and you would like to change to a pelleted diet, a veterinarian will be able to help you with the seed-to-pellet conversion, which can take time and requires a patient and committed owner. Grit is the term used for the small stones and sand that can be found in the ventriculus (also known as the gizzard) of a bird. The gizzard is a part of the stomach and is responsible for grinding up food that the bird would be otherwise unable to digest. Grit functions to increase the grinding action of the gizzard. 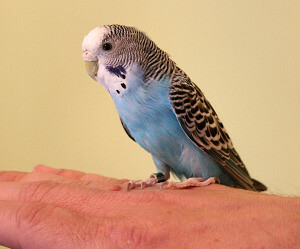 Most companion birds do not require grit as part of their diet. Grit is not only unnecessary, but it can also cause complications for birds that consume it. Consumption of grit can cause GI tract irritation and can even cause an impaction, or blockage, of the GI tract. There may be certain cases when adding grit to a bird’s diet may be beneficial to the bird. It is best to talk with your avian veterinarian to determine whether grit is necessary. Water should always be available and accessible to the bird. It should be changed at least once a day, and possibly more than that if the bird tends to be messy and places food and other objects, such as toys, into its water bowl. Using a water tube for small species of companion birds can assist with keeping the water clean and will provide several days of clean water. If changing to a water tube, be sure to have a perch close to the tube and watch the bird to make sure it is using the new water source successfully before removing the original water bowl. If using a water tube, the bird should be offered an opportunity to bath in a water bowl at least a couple of times per week.